I am indebted to Joy Osborne for supplying me with information on the two printing firms used by Johnsons of Hendon for their 'Home Photography' booklets during the 1950s and 1960s. Joy made contact with me while conducting family genealogy research relating to her grandfather, Alf Harrison, a printer in Leeds. Sadly, Joy died on 4th March 2011, but if any other relatives of the Harrison family find their way to this web page, please contact me, as Joy's son Tim is taking over his mother's genealogy research. As far as Joy has been able to establish, there is no family connection between the two printing firms. It is unknown why Johnsons chose to work with these two firms, rather than staying with just the one, though it may simply have been a sensible desire to keep prices competitive. Alfred (Alf) Harrison, Joy's grandfather, was born in Leeds in 1852. He became a Master Printer (no doubt serving an apprenticeship) and began his own printing firm by 1880 (or maybe 1878, see below) in conjunction with Thomas Waide, who was a family friend - or perhaps closer than that, as Thomas was a witness at the wedding in 1883 of Alf to his wife Alice Maud Teale, born November 2nd 1860. One of Alf's sons was named Waide, presumably after Thomas. The association between Harrison and Waide persisted both in Leeds and Harrogate into the first decade of the 20th century. Unfortunately, by 1915 Alf had succomb to a heart condition and died in Harrogate, in 1916. Joy Osborne discovered more about the connection between her grandfather and Thomas Waide during her family history research in mid-2009. An internet search led her to a book called, "Waide's 100 years" and to her delight she was able to buy a secondhand edition. It is mosly about Thomas Waide and his family and the development of the Waides printing works during their hundred years in business. The book was written to landmark the 1970s centenary, by Ewart Waide Clay, a grandson of Thomas Waide. Although the book relates little of the history involving the Harrison family, Joy found it a fascinating read. It seems that Thomas Waide and her Grandfather Alfred started up in business as a partnership in 1878, newly out of their apprenticeship with a small Leeds printer. They worked first as general printers in a cellar situated in Bridge End, Leeds, using secondhand equipment. In 1885, as business improved, they moved to premises in Hunslet Lane, Leeds and again in 1889 to buildings in Darlington St, off Kirkstall Road, Leeds. They operated there as "Thomas Waide and Sons" from about 1909 (about the time that the relationship with the Alfred Harrison broke up) until 1934, after which the Waide firm moved again. Thomas Waide died in 1932. The partnership between Thomas and Alfred came to an end after 30 years. The reasons for the breakup Joy hasn't yet discovered. She feels a disappointment with the book, in that the author, Ewart Waide Clay, gives all the credit to Thomas Waide for the development of the business and none to Alfred Harrison. Joy feels her Grandfather must have contributed a great deal, as he was an equal partner. Joy tells me that Ewart Waide Clay has written several books on the 2nd World War. The undoubted connection between the Harrison and Waide families is evident in the fact that Joy's Dad's second name was Ewart ! It must have been about 1909 that Alfred Harrison moved to 224 Burley Road, Leeds and first set up as "Alf Harrison and Sons". Alfred only had a few years with his new company as he died in 1916. Company House in Cardiff gave Joy a date for the dissolution of Alf Harrison and Sons as June 13th 1985. 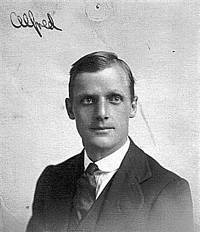 Alfred Edward was already working with Alf before 1915 and when Alf senior died, Alf jnr. kept the business going with the help of a brother (we know there were 10 siblings, including Joy's father). Alfred Edward died in 1961 and currently that is the end of the family information. However, we know that the printing firm of Alf Harrison & Sons Ltd (the Ltd title appears in the Leeds directory for 1947) survived into the late 1970s as they are recorded at 224 Burley Road, Leeds, in Yellow Pages for 1978, the same address as in the 1947 directory. Johnsons of Hendon continued to use Alf Harrison & Sons Ltd as their 'Home Photography' booklet printers until around 1970. Thereafter, the series went out of print when Johnsons withdrew from the supply of photographic chemicals. Joy Osborne subsequently discovered that the printing business of Alf Harrison & Sons went into voluntary liquidation on June 27th, 1980. Company House in Cardiff gave Joy a date for the dissolution of Alf Harrison and Sons as June 13th 1985. Joseph Cullen Sawtell was born about 1861 in Sherborne, Dorset, son of Walter Sawtell, a butcher. His mother was named Anne. Joseph started a printing business in the early 1880s. Firstly the firm was situated in 'The Parade' and later in Yeovil Road, Dorset, with a partner named A.T. Sawtell, possibly Alfred Sawtell, Joseph's younger brother. The firm stayed in Yeovil Road until at least 1939, by which time it had become a Ltd company, but there is no longer mention of either Joseph or A.T. Sawtell (by then they would have been aged 78 and 74 respectively). However, clearly the family firm survived post-WW2 as the earlier editions of 'Home Photography', from the late 1940s to the late 1950s, were printed by Sawtells of Sherborne and the penultimate edition was also printed by them, around 1968. Then, as late as 1987, they published the Paterson 'Book of Photography' and 'Book of the Darkroom'. Since writing the above notes in 2011, I have now (2017) received an email from Jenny Balch, in Oregon, USA, telling me that the A.T.Sawtell in the above paragraph was, in fact, Alfred Templeman Sawtell, her maternal great-grandfather. In 1939 Alfred Templeman's son, Alfred Hugh Sawtell (Jenny's maternal grandfather), took over the family business and ran it until 1947, at which time he sold and moved his family to the US. By 1959 the Sawtell family had returned to England, settling in Totnes, Devon, where Alfred Hugh Sawtell started another printing business. Jenny's father was a good amateur photographer and worked alongside her grandfather in the print factory where they turned out some really nice work. As a young girl, Jenny remembers visiting the shop, where she was given the task of sorting type. She says "busy (tedious ?) work for adults but fun for a child"! Jenny understands that Sawtells of Sherborne Ltd. continued printing until 1991, with its name unchanged. Jenny suggests that perhaps the new owners decided name continuity was an advantageous business strategy. The new printing company that her grandfather started in Totnes, after his 1959 return to the UK, was called Bridgeworks. It sat at the west end of the bridge over the River Dart, but the area has since been turned into residential and retail property.